Question: So David, your last year playing was..? David Seizys: My last bowl game was the Florida State Orange Bowl where we lost by the field goal at the end there. Q: You played offense and special teams, right? DS: Kickoff, punt teams, and I actually held for extra points and field goals. Q: Can you walk me through what happened there? I’m sure you were on the sidelines as Trumane Bell caught that last pass, correct? DS: We were just concerned about time at that point. We didn’t really feel like we were going to have the opportunity to kick that field goal, and all aspects of the game seemed like the clock had run out on us, you know? The officials, for some reason – they called a bad game – really had been calling a bad game the whole time. There were some bogus penalties, the touchdown that William Floyd scored – he had fumbled before he went into the end zone and I believe John Reece recovered the fumble – but they said he’d already crossed the plane. So anyways, they put time back on the clock, and without hesitation they sent us out there. Florida State had called a timeout, so it just kind of iced the whole situation. We got in the huddle, I just said something to the fact that this was one of those storybook endings that you always dream about, ‘Let’s go get this one.’ Byron marked off his steps, I got the snap and put that hold down. It took me two years to realize that it was actually a good hold, because I couldn’t watch the game. Finally, two years later I realized it was a good hold. As soon as he kicked it it looked like it was heading straight down the middle and as I was looking up a Florida State guy just came up and whacked me. And as I was kind of going down into the ground the ball kind of went with me and it went left. It was heartbreaking; a heartbreaking ending to an awesome career and an awesome time at Nebraska. You know, Osborne’s response -I saw it later- he just kind of put his head down, then looked up and said, “Okay, let’s go.” It was just the way he always preached, you know? It was all about how you play, and he said that all the time. And he lived it at that moment. Q: What else did you do on special teams? DS: I was the ‘outside contain’ on the left side on the kickoffs. Q: So you’re the guy getting ‘mugged’ as you go down the field? DS: Oh, a couple times, but you kind of learn to swim around after a while, make sure your head’s on a swivel. And on the punt team I was on the left side, again, responsible for blocking two guys and outside contain. Q: No pressure there, huh? DS: Yeah, right. And Coach Dan Young, I’d been doing it here and there in practice, and Trumane Bell -not to discredit him, but he wasn’t getting the job done- and I was standing there not doing a whole lot, not even on the kickoff team yet, and Coach Young grabs me and says, “Get in there.” I’m running in there just going, ‘Oh man, this is my one chance. Don’t blow it.’ Coach Young came up to me on Monday and said, “You’re starting on the punt team,” and I was, ‘Cool!’ From that point on it was a whirlwind. It was my dream to contribute any way I could, it just came to fruition and I made the most of the opportunities I was given. Q: Were you recruited much out of high school? DS: Just the smaller in-state schools: Doane, Midland, Dana. And I just kept saying the same thing, ‘I want to play for Nebraska.’ I think word got out that I wanted to do that so nobody else recruited me. DS: Walked on and eventually earned a scholarship. I wanna say it was the summer before my senior year. Q: How did that happen? How did it feel? DS: Well, we were in the midst of two-a-days and Coach Brown had called me out of a big meeting. He called me out and said, “You’ve been doing great things for us,” and I said, ‘Thanks.’ I thought that was all he was gonna say so I turned back to return to the meeting room and he said, “Hey, wait.” I said, ‘What’s that?’ He said, “We want to give you a scholarship.” And it was just kind of one of those, ‘Am I hearing correctly what he was saying?’ He said, “Don’t you have anything to say?” I said, ‘Yeah, I’ll definitely take the scholarship!’ and then proceeded to have one of the worst practices I’d ever had. (laughs) I was ecstatic. You know, there was a pay phone underneath the stadium at the time, and right after the meeting I ran out under the stadium and gave my parents a call, and it was one of those emotional moments where I told them I earned a scholarship. 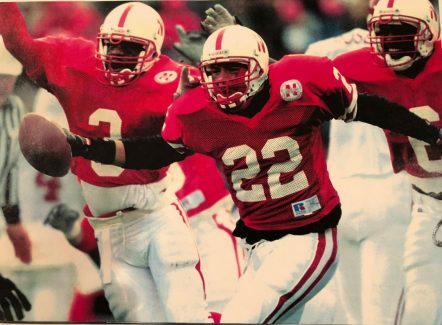 Q: Going through that process: a talented walk-on who came to NU and worked your way up the ranks and earned that scholarship… what did that do for you? DS: It set me up for life, you know? 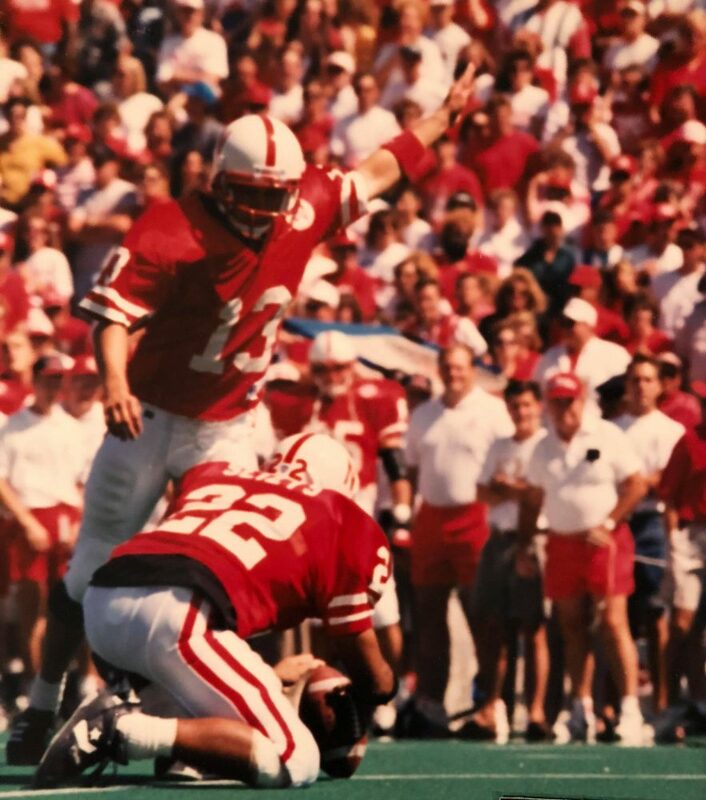 You always have those ‘what if’ moments in life: ‘What if I’d done this or what if I’d done that?’ I think I would have always questioned if I could have played at Nebraska had I not gone there. You know, some people live vicariously with those what-if’s. It’s one of those deals where you’re going, ‘Of course, I could have played 3, maybe 4 years at a smaller school, but I would always have in the back of my mind, ‘Did I sell myself short? Did I make the most of the abilities God had given me and sell that short?’’ Like I said, I’m one of those kids who lived the dream for 5 years of his life and everything that came my way was just a blessing from God. Q: Did you redshirt, David? DS: Yeah, when I was there they still had the freshman team, so I’m kind of dating myself a little bit. Shane Thorell was the coach then. Q: So you were there when the Unity Council got started? DS: The first year we had the Unity Council was my junior year. I was actually part of that my senior year, one of the receiver representatives. From when I came in, I wasn’t with the varsity much, but that redshirt year and then my sophomore year it seemed like we were on the cusp of something. We just didn’t have too much of a direction, but it seemed the Unity Council was more of, “Let’s take this out of the coaches’ hands. Let’s do this from within.” From that point on, process was being made toward that 4-5 year great run of things, where it was no more of the coaches really having to be the disciplinarians. Obviously, there were some situations: the Lawrence Phillips-kind of thing where it was taken out of the Council‘s hands. But as far as the school, getting to class, making sure you go to the study table, hooking up with tutors, that was being taken care of within. The coaches were then free to be coaches and work with us on that level where we could take care of other things. And I think the relationships with the coaches were a little different then, and although they were authoritative figures, it wasn’t seen as a discipline figure, it was more a coach, “Let’s give him the just due he deserves, because he was coach.” For lack of a better term, it was less babysitting. Q: Were there any negatives to the Unity Council? Did it create hard feelings within the team? DS: It was kind of a natural thing that happened. That first year, obviously there was a little bit of conflict there, where some guys would be, “Who put you guys in charge?”, but it was something voted on by the position players. You know, the receivers voted me on -and here I am a walk-on and this is quite an honor, first of all- and the guys on the council really started to take it seriously. The idea of it, Jack Stark was at the forefront of that and just really put the presence of the players in there, and after awhile the resentment was gone and they understood what we were trying to do. We were trying to clean house and go in the right direction. We were at a roadblock and needed something else to get us over the top, kind of bring it over the edge. Q: Were some guys actually kicked off the team? DS: If there was ever any kicking-off happened, that was in Coach Osborne’s hands. Q: Did we have some ‘problem children’, for lack of a better term? DS: Yeah, there were. Absolutely, there were some repeat offenders. Once it got to that point of making that decision of whether they stay or go we made our recommendations, then that was in Coach Osborne’s hands. There actually were some recommendations, some that were followed through. Specific players, I don’t remember kicking off, but there were some we sent to Osborne, and those kind of held up. Q: It created a sense of ownership through the democratic process, then? DS: It wasn’t one of those things where this was set up and the coaches would take it out of our hands. They kept it in our laps and on the table and they let us run with it. DS: It was one of those things that was needed. It was player-directed, player-led, and there was always a coach there so it didn’t get out of hand. They were there just kind of monitoring and they let us do our thing. I don’t want people to think it was the driving force that led to the turnaround, but it was key. It can’t be discounted. Q: Were you good friends with Byron Bennett? DS: Oh yeah, obviously we’d spend an awful lot of time together: I’m holding and he’s kicking. It was just for that year, 1993. Just being a kicker and being on special teams you’re kind of aware who those guys are. He was a great guy to be around. Q: Do you keep in touch with him? DS: No. I think of him often, but it’s one of those things where life kind of happens and you just lose touch. If you ever get ahold of him just tell him I miss him. Q: So tell me, do you have a favorite play from your time in uniform?